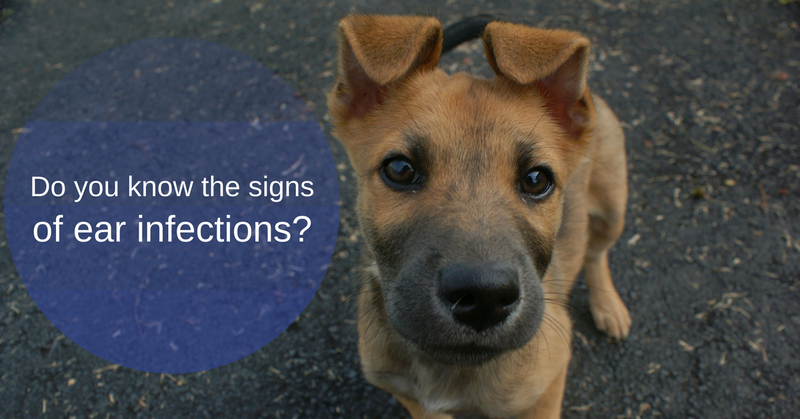 The cause for most dog ear infections is either yeast or bacteria that’s trapped in the ears. Yet, ear mites, wax buildup, or allergies can also cause painful ear infections in dogs. In just a moment, you’ll discover how to spot the usual symptoms of an ear infection, but first, did you know that some /services/dogsdogs are predisposed to frequent ear problems? For example, dogs with long ears like Basset Hounds are the “poster dog” of breeds that suffer with frequent ear infections. This is because their ears stay covered most of the time, so it’s an ideal breeding ground for bacteria - dark, warm, and moist. However, any dogs with allergies or who swim a lot are also prone to ear infections. And you’ll see that chronic ear infections are a sign of a deeper problem and definitely something to explore with your veterinarian. Among the most common signs of dog ear infections are whining, shaking the head, and pawing at the ears. After all, those ears hurt and your dog is trying to stop the pain. As you inspect the ears, however, you may find they smell or have a discharge. That’s common with ear infections. More extreme symptoms include hearing loss, loss of balance, and strange eye movements. The first step is cleaning the ear with a gentle cleanser; we'll recommend or dispense an appropriate product during your dog's appointment. In some cases, your veterinarian will need to sedate your dog and do this in-office as it may be painful for your dog. Generally, however, we'll demonstrate cleaning techniques -- and even help you practice -- so that you can do this at home. “An effective way to clean the ear is to fill the ear canal with the cleaning solution, place an appropriate-sized cotton ball in the ear canal opening, then gently massage the ear at the base. The cotton ball serves several functions. It acts as a lid to the allow the fluid to go back and forth in the canal, it absorbs the excess solution and it holds onto the debris as it comes up, letting you know what is down in the ear canal. If your dog is prone to chronic ear infections, then you’ll want to discover the cause so that you can prevent them. In some cases, regular cleaning once or twice a week clears up the problem while in others, it’s not so simple. In these latter cases, it often turns out to be allergy-related. Your dog may have environmental allergies, such as to pollen, or food-related allergies, such as to chicken, soy, or beef. We'll work with you; as a team our goal will be to track down allergens and provide your precious pup with relief. If you have any concerns about your dog's ears, please contact us. Breed disposition, lifestyle, and allergies can all contribute to the development of ear infections, and we're here to help you with both treatment and prevention.